Be the first to share your favorite memory, photo or story of Cleo. This memorial page is dedicated for family, friends and future generations to celebrate the life of their loved one. Cleo Albert Harding was born June 4, 1931 in New Rockford, North Dakota. He was the youngest of 12 children born to Thomas and Regina (Ehlers) Harding. Cleo passed away on January 23, 2019 in McMinnville, Oregon. The family farmed in the New Rockford area and Cleo attended one-room country schools. In 1943 the family moved to the St. Johns area of Portland. Cleo got his first job on a paper route and then in 1947 as a Butcher’s Apprentice at Fred Meyer. He graduated from Roosevelt High School in 1950, the first in his family to do so. In Portland he discovered sports, especially baseball, and was also a Boy Scout. Cleo joined the Navy in 1951 and spent his tour of duty in the Mediterranean and Caribbean. Upon leaving the Navy in 1954 he worked as a sheetrocker for his brother-in-law at JB Beck Construction. During this time Cleo attended Portland State University. In 1956 he married the love of his life Patricia Russell. They met in 1944 when Regina was a babysitter for Pat. In 1957 Cleo and Pat welcomed their first daughter, Lori, and in 1960 another daughter Jodi. In 1959 Cleo and Pat moved to her grandparents’ farm just south of McMinnville. Cleo spent the next 40 years farming alfalfa, wheat, clover, walnuts and grass seed. Also during those years Cleo raised beef and dairy cows, hogs and sheep. He was forever grateful for the opportunity to farm. Cleo was also an avid card player since childhood and many a game were enjoyed over the years with family and friends. Upon retiring Cleo and Pat enjoyed many trips with their friends and family to Alaska, North Dakota and the Midwest, Hawaii, Canada, and several cruises including Europe and Caribbean. Over the years Cleo became an asset to his community serving with the Bellevue Community Hall, Yamhill County Livestock Association, Amity Co-op Board, FHA Advisory Board, Yamhill County Fair Board, Sheridan Land Planning Commission, and West Valley Farmers Co-op. 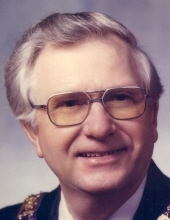 He also spent many years in service with McMinnville BPOE Elks, beginning as Chaplin and ending as Exalted Ruler in 1983. Cleo was also a volunteer at Willamette Valley Medical Center, a job he truly loved. Cleo was grateful for every opportunity, for his wide circle of friends, and especially his loving family. Cleo is survived by his wife Patricia, daughters Lori Strahm (Ernie) of Carlton and Jodi Boundy (Mike), grandchildren, Jenna Vernon (Jeremy) and Jon Boundy (Courtney) all of McMinnville. Services will be held Saturday, February 2, 2019, 2:00pm at Macy and Sons, McMinnville, Oregon. Contributions may be made in honor of Cleo to Yamhill County Historical Society or Yamhill County 4-H.
To send flowers or a remembrance gift to the family of Cleo Albert Harding, please visit our Tribute Store. "Email Address" would like to share the life celebration of Cleo Albert Harding. Click on the "link" to go to share a favorite memory or leave a condolence message for the family.